We have been wanting to make this since we saw it on Everyday Food on PBS a couple of months ago. 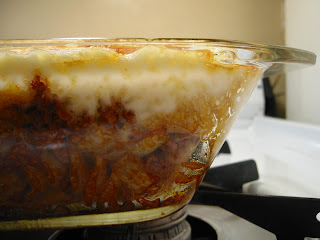 We have never heard of Pastitsio before -- it reminds me of a pasta version of moussaka. We finally made it today and it is delicous. We used rotini instead of penne. Preheat oven to 375F. Cook pasta and drain; reserve. Meanwhile, in a large saucepan, over medium heat, cook lamb, breaking apart pieces with wooden spoon, until no longer pink, 6-8 minutes. Add onions; cook, stirring occasionally, until translucent, about 5 minutes. Transfer to a colander and drain out the fat. Return lamb to pan; add wine. Cook over medium heat until almost all liquid has evaporated, about 5 minutes. 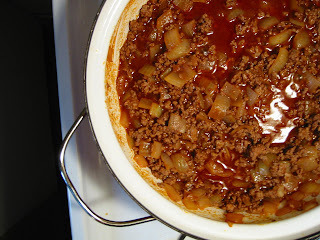 Stir in tomato paste, cinnamon, and 2 cups of water; simmer, stirring occasionally, until thicken, 15-20 minutes. Season with salt and pepper. 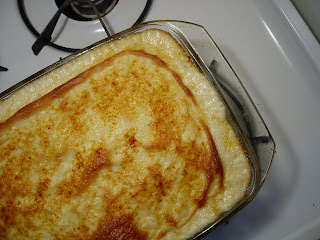 Make mornay sauce while mixture is simmering: In a medium saucepan, melt butter over medium heat; whisk in flour until incorporated, about 30 seconds. In a slow steady stream, whisk in milk until there are no lumps. Cook, whisking often, until mixture is thick and bubbly and coasts the back of a wooden spoon, 6-8 minutes. Stir in cayenne if using, and Parmesan. Add pasta to lamb mixture; transfer to 9x13-inch baking dish. Pour sauce over top, smoothing with the back of a spoon until level. Bake until browned in spots, 35-40 minutes. Remove from oven; let cool 15 minutes before serving. From Everyday Food on PBS.